If you know me, you may know how much I love www.mint.com, the financial tracking and organization site. It can automatically import your financial activity from a ton of banks, and does categorization, trending, budgeting, and spending comparisons with users in your area. The downfall, though, has been that Mint has lacked mobile device access. Some of the site could be access, but it was pretty heavy and formatted for a large screen. Also, features like trending are flash based, and wouldn’t work at all. Mint has launched an iPhone/Touch App [iTunes Link] that fills this need, at least for Mobile Safari users. I still hope they launch a more generic mobile site for other device users, or at least native apps for Blackberry and Windows Mobile. 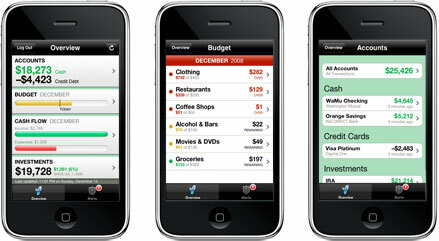 As an iPhone user, though, I’m completely elated, as I now have a mobile glimpse at my financial situation. The app is a bit limited right now, it’s focused purely on viewing data. I’d like to see the ability to edit the categories of transactions instead of just viewing what’s already set. I’d also LOVE to see the ability to add cash transactions from within the app, since that would let you track cash spending in addition to the check/debit/credit transactions that are already tracked. Overall though, the app is a great start, and the limited features it has right now keep the app simple, fast, and easy to use.